Several times I thought about writing about my experiences as a first-year librarian at ACRL in Baltimore, but many others wrote about the controversies, the twitter fights, and the OA panel better than I could have. Zoe Fisher’s post about the twitter fiasco is a must read as well as Veronica’s post on ACRL. As a new librarian, something stuck with me though, and that is the idea of failure and works in progress at the conference. A conversation with Katlyn Griffin, a fellow new librarian, and I had via twitter and in person about the idea of “works in progress” or even “failed projects” as learning opportunities at conferences. ACRL, as I’m sure many of you know, isn’t the venue for unfinished or failed products. As a field that feels on the brink, it is difficult to talk about projects that fall flat. No one, least of all me, wants to broadcast failures. Unfortunately, if you’re a new person, it is often the failed projects or the work-in-progress projects are all that you have to contribute. I think there is a difference between work-in-progress and failures, but they exist at this periphery of prepared and completed national conference level discussion. I presented a work-in-progress at ACRL and it actually went very well; I learned a lot about the process and it helped me move towards a conclusion, and I believe that conferences should encourage unfinished work outside of the lightning rounds where the blur makes the projects blend in with the background. But where does failure stand? It is difficult to broadcast or talk about failing, especially in competitive circles, but I am a product of failure. Prior to library school I was on a traditional academic path. I interviewed at PRESTIGIOUS UNIVERSITY for a PhD program in Media Studies. After three days of being wined and/or dined, tours of campus, meetings with students and faculty, talking about my future there, I was not given a spot in the program. I felt rejected, like all that I had been working toward was squashed on the whims of a committee. I thought a lot about why I was drawn to the field and where I was the happiest when I was a student. That place for me was the library. I was interested in memory and media but more than that I was interested in knowledge as an academic field. Ultimately, the library was the better and wiser choice for me. I am thankful that prestigious university did not pick me for their PhD program, as much as it hurt at the time. I’m able to write and publish about topics I feel passionate about, teach and work with students, support faculty, and I’m extremely happy to be where I am. Libraries are my home, but still I felt like it was a “plan b.” I’m certain that I’m not the only one out there in our field who has a similar story. Even writing this paragraph was difficult because failures, or the perceptions of failure or disappointment, are difficult to talk about. It would be even more difficult to stand in front of an audience of colleagues and say “this is what went wrong.” Imagine that during a staff meeting… now imagine it during a National conference. Given the response that accompanied the polished, but controversial, papers presented at ACRL, I wonder what the response would be if a paper concluded with “this project failed.” Would it be seen as a waste of time? Would the twitter-sphere explode in rage at the failed project? Currently, we all struggle silently alone. In the past year I’ve had a few projects go awry. I had our Research Week Student Research Symposium hosted entirely by our Institutional Repository, it did not go well. In the end, our research office decided to go another direction but will now require students to deposit their materials. This was my first professional set back, but it allowed me to grow and see where the edges were in our partnerships across campus. I worked extremely hard on getting this to work, and in the end it just could not do what our research office wanted. Does this reflect poorly on me as a librarian? I thought so at the time. When I took a step back and thought about it, I really began to believe that this was a bump on a long road. Sharing this experience with the other librarians and saying “here is what didn’t work,” allowed all of us to learn from this experience. Getting all of the student projects deposited in the IR after the fact is all that I wanted in the first place, so this failure ended up as a slight win. Projects fail. We do not know when that they will fail when we start them, if we did we probably wouldn’t repeat the mistakes that caused the problems, but these are valuable opportunities to learn about the process and the problems we all share. If creativity and experimentation are valued in our field then there should be expectations of failure and we should talk about them openly. I firmly believe that opening forums like ACRL or ALA to “failure talks” could be a great asset for new and old librarians. Talking frankly about what went wrong instead of sweeping it under the rug should be a goal of the larger library community. More importantly, we fail. Failure has formed me as a librarian. We sometimes do not get the jobs we desperately wanted, or the promotion, or the book chapter. Right now the culture tells us to be quiet about these instances and shames; because being a sore loser or being upset about losing out on a fellowship or project is unbecoming and might jeopardize our future goals. I don’t agree with this because I think as a field we should grow to a place where we are not ashamed of our baggage and our failures and drop the feelings of animosity and competition. Especially for new librarians where the road upwards is the most difficult, letting individual failures be known is a powerful reminder of what we have to gain and lose as a field. Ultimately, this means that successful librarians must lift up those around us when projects or goals fail. We should be open about our failures to serve as a guide to those who will follow, and lift up those who are not as lucky as we. I’m three months into my first year as an academic librarian and it has been a whirlwind. Conversations with many of my LIS friends confirm that the transition to professional librarianship presents invigorating ups as well as exhausting downs. Something I have been trying to focus on is embracing the ups and moving quickly and gracefully past the downs (with a little reflection). In the spirit of trying to get better at this, I’d like to share the best “up” I’ve found in my short three months as an Information Literacy Librarian. I so appreciate April’s observation that it creates a stronger connection between experience and learning. Accardi adds that students are whole people in the classroom and that they “bring with them all of the things that make them human—their stories, their beliefs, their filters, their talents, their challenges, their emotional baggage, everything” (p. 12). Why can’t librarians be whole people too? Why can’t we bring the same baggage into the classroom? And doesn’t being “whole” make us more approachable? Doesn’t it make research more approachable? I believe that it does. So how does one even start to integrate more personal experience into their teaching? Many of the tactics I have tried stem from an intensive research project I’m currently doing. I’m completing my first peer-reviewed article for In the Library with the Leadpipe and I have found that this provides rich testimony for many different research issues. For example, I recently asked students to articulate what their research process looks like. They spent a few minutes drawing their process, from the time a research project is assigned to the time that they turn it in. We then tried to combine their ideas into one complex research process on the board. I was currently going through my own research process and I used this opportunity to challenge them with trials I had faced. I asked the students questions like “but what happens if you’re tracking down citations and you suddenly realize someone has already written the paper you’re writing?” and “how is research continually part of the writing process?,” often providing tangible examples from my article along the way. Before we knew it, the board was covered in arrows, illustrating the iteration necessary to do quality research. After the class, the professor came to my office to thank me. 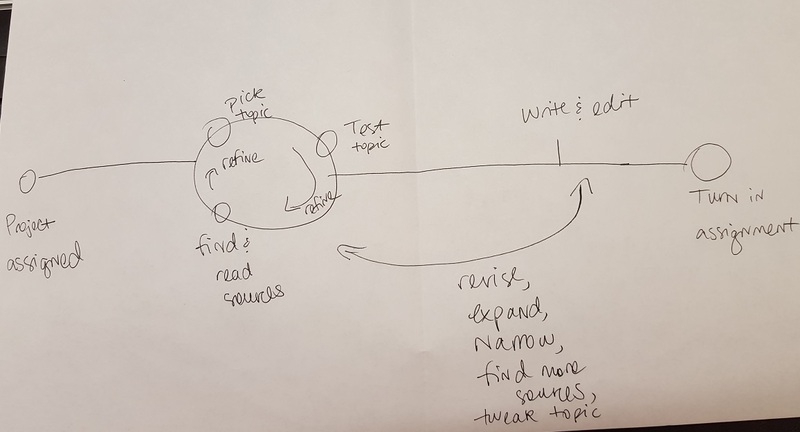 She said that she thought that the activity might have been the first time her students have had to articulate exactly what their process looks like. She said that she thought it would definitely help the students be more thoughtful researchers. I also believe that it made iteration and revision “okay” and maybe even reduced some library anxiety. I have also used my experience with Leadpipe to facilitate conversations about how peer review works, blind vs. open and more collaborative forms of peer review, and the time it takes to complete vetting processes. This often sparks a more thoughtful and nuanced conversation about the pros and cons of peer review, which moves students away from peer-reviewed-equals-good-and-popular-sources-equals-bad conversation. I have also plugged our citation management system, Zotero, in these conversations. I have a single-spaced twenty-five page document of notes and draft citations for my article (no, this is, unfortunately, not a joke). I might risk compromising my “expertise” with students by sharing this fact and letting them know that I wish I would have used Zotero at the beginning of my project. Again, it is definitely nerve-wracking to be vulnerable in this moment. But I think it makes me more human and illustrates to students that research is a continual learning process, even for librarians. Sharing your experience can be as simple as sharing tidbits about how you approach research. How do you figure out what the scholarly conversation is? What tools do you use to start your research? Do these change after you know the important scholars or disciplines for your topic? For example, I often share that one of my favorite ways of entering the scholarly conversation is by reading more about my general topic area and then finding claims I’d like to challenge or push back on and doing citation tracking from there. You can even reflect on the research you did in undergrad or graduate school. How did you use class readings to guide your thesis development? How did you organize your research? The point is not to show that you’re perfect. The point is to show that imperfect research can be successful too and that librarians can help guide students through this process because we’ve been there. This work is not always easy. I have definitely noticed that sharing personal experience in the classroom can be harder or easier because of class dynamics, faculty involvement, or even student level. The reality is that it is difficult to build trust in the classroom when sometimes the space doesn’t even feel like your own. I hope to continue to brainstorm how sharing personal experience can go beyond the one-shot session. For example, I am currently thinking through how I might use some of this testimony in my research consultations with students. How do you incorporate your personal experience into your teaching? Students log into programs (i.e. for course management, registration, email, etc.) run by their school, and then they need a separate authentication to access library resources? This actively discourages them from using the library. A single login is a usability priority. Once users are authenticated as enrolled, active students, they should be able to access all of the services the college provides to them — including all of the library resources and services. A few weeks ago I had my first patron complain about how she couldn’t connect to library databases with her Blackberry. (Our authentication system doesn’t allow it. See #1.) So now I am learning about mobile platforms. Luckily there are lots of librarians already working on this. Online students may never come to the physical library building, but they can still benefit from the library’s array of online resources. Putting these online resources seamlessly into their classrooms is the next step. Students no longer have to go to the library for the materials needed for their classes — the library can come to them. We can put reserve materials, information literacy activities, catalog and database search boxes, etc. DIRECTLY into their class spaces. This is why instructional design is so important to me right now. Daily, I find myself solving common technical problems of students that are not just limited to printing and word processing. Even if I am not officially tech support, I am an adult sitting at a desk in a public space surrounded by computers, so guess what? I am going to answer a variety of computer questions. I know some librarians resent this, and I am never happy when a technical problem interrupts a research question, but most technical problems are things I have encountered myself and can solve quickly, or are ultimately relevant to my own computer use. If we do not get to work with our students in person, we need to provide online help. And ultimately how would be best to do this? With fun and exciting video tutorials, naturally! Maybe I should have gone to film school after all. There is a lot of relatively inexpensive software available now to make and edit your own videos for the purpose of training. It is true that these can take a lot of time and thought, but when done well they can be extremely effective, provide help 24/7, and replace the need for repeated explanations of simple instructions from librarians. I am sure there are plenty of other examples, but these are what I have for now. Please feel free to chime in!